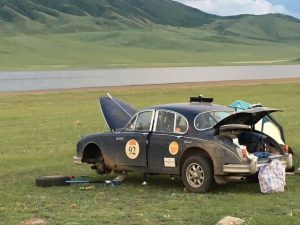 Once you finally arrive at camp there is little time to relax as the first thing to do is check the car for any damage. We are having issues with the shock absorbers and the tyres rubbing on the front wings. The mechanical back up is excellent as the sweep crews offer help and guidance – but talking to 20 mechanics is the same as talking to 20 economists in terms of the options suggested. We have tried running the shocks softer and harder and have great rationales offered for both. One thing that is bizarre is that, given what our car was built for, it actually is better to drive off road than on road. Long undulations in the roads make the tyres hit the wings frequently while the short sharp bangs and crashes in the tracks are less annoying. Alternatively there are so many things rattling when we are off road that we just cant hear the tyres rub the wheel arch. It is definitely the case that the start of any latest insistent noise is somewhat worrying but it is amazing how quickly you just accept it as part of the general background cacophony. My fancy Heinplanet air tent has sprung a leak!.. hope you are reading this Heimplanet – your fancy and expensive tent lasted just 4 nights! Looking into one of the valves I can see that the inner tube is tightly twisted. How this has happened inside the tubes I am not sure as while I am not enjoying camping that much (at all) I am at least pretty efficient and careful in putting the tent up and down and packing it away. To try to find and fix the leak I have to, very gently, pull the inner tube out through the valve – helpfully the inner tube seems to have the strength of gossamer – and having stuck the massive patches provided over the 2 holes I wait the requisite hours to actually inflate the tent. 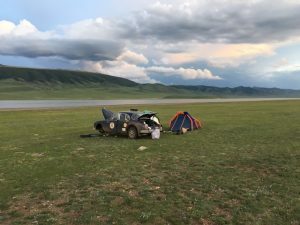 On deciding that the likelihood of the tent staying up all night is quite remote I approach the Nomad’s for a spare – for $25 they loan and erect a double skin tent that I can actually stand up in and then in the morning I just leave it for them to put down and take away. Why is this not better advertised? – who needed a tent!. I am one step away from trying to get room service and a morning newspaper. Matt has no such sleeping issues and just keeps taking wheels of the car. 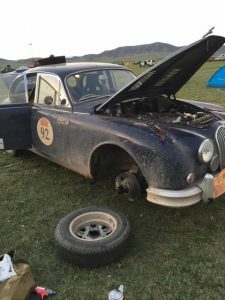 It stays so light late into the night that we are generally going to bed while the sounds of patching up (cars not tents) is still in full swing in the camp.